Thomas Baron Pitfield was born Apr 5 1903 in Bolton. He was a music teacher, composer, 'cellist, pianist, engineer, inventor, artist, calligrapher, woodworker, cabinet maker, book binder, lino print maker,writer, essayist, pacifist, conscientious objector and vegetarian. In his teen years he worked in engineering on leaving school at 14. In 1924 he entered the Royal Manchester College of Music for a year. 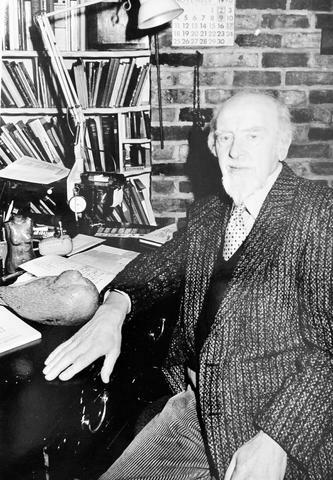 He taught at Tettenhall College from 1935-1945, becoming composition tutor at the Royal Manchester College of Music in 1947 and latterly the Royal Northern College of Music, retiring in 1973. His numerous compositions included works for orchestra, brass band, chamber ensembles, piano solo, and choral. Pitfield published 2 volumes of autobiography: No Song, No Supper (1986) and A Song After Supper (1991), and many other works. Fuller details of his life can be found in these volumes. He married Alice Astbury, a fellow student at the RMCM, on December 26 1934, and died in 1999.